forgive the old lady in the baggy clothes. it's been humid all year and after working outside, downstairs I wear baggy pants and a baggy shirt. upstairs I wear a long shirt. *jones the basenji dining on leon's homecooked chicken stew. he's maintaining his weight. he needs to gain. 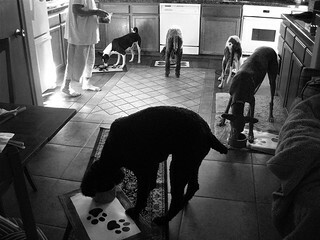 *schubert the blue standard poodle dining on raw hamburger and chicken, no kibble. he hates it. *marina the podenco ibicenco, eating a huge amount of raw meat and a huge amount of kibble, trying to gain some weight. *chai the smooth saluki with raw meat and a little kibble. I got his weight down a little and want to maintain where he is now. *louie louie the chunk of a black standard poodle on raw meat and a bit of kibble. he needs to lose weight. I am holding leon's homemade dog cookies for their dessert. yum. I nibble on them, too. this is leon's photo, converted to b&w.